When it comes to Highlands homes, outdoor entertaining spaces have huge appeal. The outdoors is the reason most of us moved to the area to begin with and is certainly a priority for second home buyers. 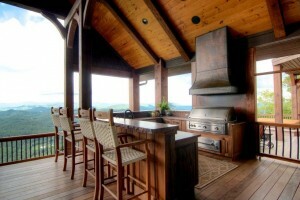 Outdoor spaces surrounding our homes allow for us to enjoy the fresh mountain air and views to the fullest. Current design trends are making it more and more feasible and popular to entertain outside. From lavish screened porches to custom built outdoor fireplaces and kitchens we can now capitalize on the outdoors during a good portion of the year, outside of the hottest months. While some aspects of outdoor design are simple and others elaborate, adding entertaining elements to the area surrounding your Highlands home can add to its value. Contact me, Lynn Kimball, today to learn more about real estate in Highlands and current home trends. I keep my fingers on the pulse of the market in an effort to keep my clients educated and informed. Let my knowledge and experience work to your advantage for all of your Highlands real estate needs. Click here to read “More Home Owners Carve Out Outdoor Entertainment Spaces” from Realtor Magazine.